Artem Anisimov is a product of the Yaroslavl hockey school. He was brought to the hockey club by his parents, who hoped hockey would be an outlet for their active son. At the age of 16, Anisimov played in his debut semi-professional hockey match. He played the 2004-2005 season for the junior farm club, Lokomotiv 2. Having scored more than 20 goals, Anisimov was "promoted" to the first Lokomotiv team. He had a rough first season, though, with only 10 games during the entire season and only one assist point. Nevertheless, Anisimov managed to prove to the new Yaroslavl Lokomotiv coach that he was a valuable asset. He became a true team leader, scoring 10 goals in the regular championship and seven points in the playoff games, in which he was named the best Lokomotiv player. The team did not, however, make it far in the playoffs and the Lokomotiv bosses started looking for a new coach. Meanwhile, Anisimov was seeking a stronger club. 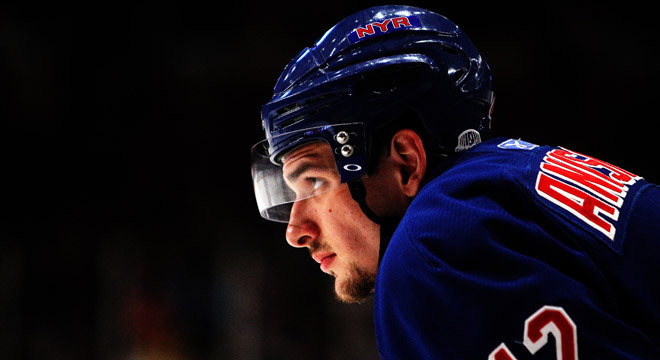 Anisimov arrived in the U.S. from Russia at age 19 and wound up in the Rangers farm club where he played two seasons. As a member of the Hartford Wolf Pack, he was one of the best forwards in the league and was chosen to play in an American Hockey League All-Star Game. In February 2009, he made his NHL debut at Madison Square Garden in a match against Ilya Kovalchuk and the Atlanta Thrashers. Anisimov did not manage to score a goal, and that was his only match for the Blue Shirts that season. But by the fall of 2009 he was a permanent member of the Rangers’ main team. During his first season for the New York Rangers, Anisimov demonstrated his worth but he admitted that he was shy of his star partners. He was afraid of taking the lead and often played it too safe. He scored 12 goals and had 15 assists during the first season, but everyone could see that his potential was still untapped. The American media claimed the young forward would be scoring 60 goals per season and Anisimov almost proved them right the following season. The New York Rangers forward became the fifth-best striker on the team, improving his results and showing a mature game. His overall 44 points (including 18 goals) was a great result for the 23-year-old that season. Anisimov gained confidence in tackling his opponents and playing defense and, despite his talent, he was always ready for lots of hard work. In the summer, Anisimov became a restricted free agent and the Rangers managers did their best to keep the young Russian. Anisimov re-signed with the Rangers, scoring a seven-digit contract and more time on the rink. So far this season, he has posted 16 goals and 20 assists for 36 points and it is thanks largely to Anisimov that the Rangers won the Atlantic Division and are now one of the Stanley Cup Playoff favorites. "No, he`s not mean. He tells you the truth, I like that. Just today, in the first period, he said to me: 'If you don`t wake up, you can get lost, you can sit on the bench.' I understood." The Rangers unit of Dubinsky—Anisimov—Callahan is known as “The Battery Line,” both for its energy and because the initials of these forwards is the same as the names of U.S. battery sizes: D—AA—C. During the 2011/12 season, Anisimov created a small uproar as the result of his unusual celebration on the ice of a goal he made against Tampa. He dropped to one knee and used his hockey stick as a mock rifle to “fire” at the Lightning goaltender. His opponents were not amused. Tampa Bay captain Vinny Lecavalier came at Anisimov with his fists, and a brawl ensued. But he is a fan of the NBA. “When I was in Cleveland, I found time and went to a basketball game. I saw the one and only LeBron James in action. Well, he is the best,” Anisimov said.